Albert Michael Zwar was born in ‘The Hut’ – the old house on the farm – at Broadford on July 17th 1863. Albert started work as a clerk in Bourke Street in Melbourne, in the hardware section of Eliza Tinsley Pty Ltd. The contacts he made working here would later help him develop the tannery at Beechworth. Albert moved north to Yarrawonga, a small town or the banks of the Murray River. Here he conducted a small business. In 1888 William Zwar, Albert’s older brother by two years, became interested in buying the Ovens Tannery at Beechworth. The tannery had been established in 1858 by Matthew Dodd and was run by the Dodd family until 1887 when it was advertised for sale. The tannery consisted of four small buildings and employed fifteen men. William Zwar consulted his younger brother Albert to get some business advice before purchasing the Ovens Tannery, including the freehold title, in 1888. William had learnt the skills of the tanning trade as an apprentice, but lacked the administrative skills and business experience necessary to run a business. He sent for his younger brother Albert who was a trained clerk with some business expertise. In 1888 Albert left Yarrawonga and joined his brother William in Beechworth. The two brothers needed finance. Albert contacted Leonard Lloyd, the proprietor of Eliza Tinsley Pty Ltd. where he had once been employed. Lloyd became the third partner in their new business venture, each partner sharing a third interest. They registered their partnership as “Zwar Bros & Co”, renamed the tannery “The Beechworth Tannery”, and began operations in September 1888. Albert Michael Zwar was 25 years old when he moved to Beechworth to join his brother William in the new enterprise. William provided the tanning know-how. Albert provided the business acumen, and Lloyd the finance. The vendors who handled the sale of the tannery were sure the enterprise would collapse! “Forty years ago a young man named A M Zwar decided to go into the leather business. He began in a small shed with half a dozen hides; he stuck to it, married, begat him sons in whose nostrils the smell of leather was a myrrh and frankincense, brought three of them into the business and the four tackled the job of making it one of the biggest tanneries in Australia. Today A M Zwar is in the Legislative Council; he is, besides, uncrowned King of Beechworth, and so manifold are his activities that Beechworth divides its existence into post and pre-Zwar days. Zwar is a driving force, there is no doubt of it. He is an excellent businessman, but excellent businessmen do not make industries like this one on business brains alone. There is an idealism that is welded to capacity, a sense of what is due to the community in the way of service, so that when a man takes, he but takes that which he has already given in part. Such a man makes enemies, and Beechworth has its Capulets and Montagues. There are anti-Zwars who see in the big man a stumbling block to their own ambitions. Also I have no doubt that in a small community a big man sometimes is inclined to “bullock through” objections and govern the town he has helped so largely to make. This makes for enmity. Nevertheless, one cannot be long in Beechworth without realizing that Beechworth is A M Zwar. His chief business is the tannery, which employs normally about 300 men (200 at present) and therefore maintains almost that number of families in the town. The journalist also mentions Albert’s controlling interest in the local newspaper, “The Ovens and Murray Advertiser”. “On the 10th May at the residence of bride’s mother by the Rev W Cooper A M Zwar fourth son of M Zwar Broadford to H A (Hatta) Lawrence only daughter of the late J D Lawrence, Beechworth. Harriet was a devoted wife and mother. She made no social pretensions. Her family and her home were her main interests. She was fond of her husband and family and her grandchildren affectionately called her ‘Gogga’. Albert was a reserved man by nature. A big man physically, he was known as “The Big Fella”. To outsiders he seemed to be a stern and sometimes severe man. He was not easily approachable, and it could be difficult to converse with him, as he tended to be a man of few words. He had no patience with fools. He was a good judge of character. He would strike a commanding figure as, every morning he would walk down the street with a faithful little terrier at his heels – each providing a striking contrast in their sizes – as he called in at the barbers and on the accountant and solicitor. Behind his stern exterior there lay a deep concern for the town and its people. Albert privately helped many a family through difficulties (particularly in the hard days of the Depression) without many people being aware of it. This was part of his reserved nature. To those who knew him closely, including his family, they found he had quite a ready sense of humour and they knew he was not as hard a man as his reputation would sometimes suggest. To them he was a ‘Man’s Man’ – a big man with a big nature. Albert and Harriet had six children. A daughter Doris, and then the three sons, Keith, Raymond and Bernard. And then two more daughters. On Tuesday 18th March 1902 their seven-month-old daughter Una Agnes died. “On Monday night last Una Agnes, the infant daughter of Mr. A M Zwar was taken suddenly ill. Dr Hearne prescribed for the little sufferer, but pneumonia supervened and on Tuesday night she passed away in her father’s arms. Another daughter Leila arrived in 1905. Albert and Harriet lived in a large house in Church Street called ‘Wyuna’. (It is opposite the R.C. Church and is now converted into flats). In their big home Albert would make his way into the study after the evening dinner. In the study he would not be disturbed. It was his domain, just as the dining room and kitchen were the domain of Harriet and he would not intrude there. On Sunday evenings their married children would come for dinner. Harriet would then attend church, while Albert loved to repair to the billiards room with the boys. Albert loved the outdoor life – a bit of farming, fishing and hunting. He was a fanatic cod fisherman, and loved to spend several days at Dora Dora on the River Murray trying to hook a whopper. I have this day received the lovely bike you so kindly sent me. I may never have the pleasure of meeting you but all my life I will thank you. Surprisingly, Albert never took out a licence to drive a car. In his earlier days he drove a buggy and horses. In the later years his three sons would drive him by car wherever he wanted to go. “certain of Mr. Zwar’s contributions to the Beechworth community should be mentioned. During the depression years he was largely responsible for the establishment of the Stanley pine forest of 5000 acres by the use of unemployment grants from the Government. The gorge road is another example of his influence in obtaining relief moneys which enabled Cameron & Stone to complete the southern end of the road making it a continuous circuit. Noxious weeds and other grants were obtained as a direct result of his Parliamentary influence. He bought the Federal Hall from the Estate of the Late Dr. Skinner in 1920 and assisted a young returned soldier in building up a motion picture business prior to selling the premises to him in 1926. When the Beechworth Mart – Upper Ford St. – was closed in 1927 he purchased the property from Walter J. Edwards and assisted another young man to establish himself in a garage. The site was later sold in easy terms to Robert Pyle. These are only two of the many instances of his generous help to young businessmen and home purchasers. Albert’s main interest was naturally in the tannery. Space in this biography does not allow us more than a glimpse of the growth and development of the tannery. The tannery buildings grew to cover six acres and it produced an amazing number of products. In 1900 a large overseas export trade was being developed. eg. In 1919 315 tons were shipped to the U. K. alone. In the early years numerous properties adjoining the tannery were purchased. Sheep and cattle were raised on these properties, potatoes were grown, and “even a season or two of tobacco” (J. J. Macaulay). In 1905 Zwar Bros bought eight acres adjoining the tannery from the M. Dodd estate for six pounds per acre. The tannery began producing large quantities of football leather early this century, supplying particularly T.W. Sherrin – still a household name appearing on Australian Rules footballs. “In 1914 production was converted to meet the military requirements of the Australian, British, Indian and South African Governments’‘. In September 1915 a disastrous fire burnt the Tannery to the ground. Albert considered moving to Melbourne and rebuilding the tannery there, mainly to save the huge freight costs, but the town of Beechworth rallied with support and the Government reduced the freight costs. Soon afterwards the tannery was completely rebuilt and rapid expansion followed. By 1918 four of Albert’s children had joined the staff. His youngest brother, Henry Peter Zwar, had also acquired an interest in the Tannery over the years. This ended in 1911 when Henry left to join another brother William in the tannery at Preston. Albert was now the sole owner of the Beechworth Tannery. 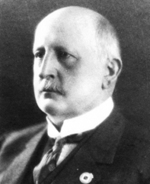 In 1920 the Zwar Bros. Co. was incorporated with Albert as Chairman and Managing Director; his two sons Keith and Raymond as Directors; and the remaining children and in-laws included as shareholders. The most famous product of the Tannery at this time was ‘Trubuk’, a pure white leather first produced in 1919, and the first true white leather produced in Australia. In October 1923 Harriet and Albert lost a second daughter. Beechworth people have been recently shocked and alarmed by the sudden deaths of several apparently healthy young girls. A week ago there was none brighter nor happier than Leila, the youngest daughter of the Hon A M Zwar MLC and Mrs. Zwar and there seemed nothing to interfere with her bright prospects. After attending the social functions and entertainments of the weekend Miss Zwar complained of indisposition in the early hours of Monday 22nd, and as her health did not improve medical advice was sought and her recovery was never in doubt. The best medical and nursing care was provided but by Sunday her condition became so critical that in the Anglican Church prayers were offered on her behalf. From Melbourne a serum was dispatched by motorcar on Sunday as a last desperate resource and her father’s powerful car met it on the way and brought it on to Beechworth. She lingered until Monday afternoon. Public sympathy was aroused to an extraordinary extent by the death of this young girl and the funeral one of the longest seen in Beechworth. Messrs John Zwar, Dr Lawrence, Messrs H H Fuya, W. J. Barnes were coffin bearers. Out of sympathy all social functions for this week have either been cancelled or postponed. In 1926 they were saddened again when they lost a son in law, John McConville, who had married their daughter Doris. He was only 32 years old and left two little daughters. In the 1920’s the growing car market demanded large supplies of upholstery leather. This became a major production line until cloth and plastics took their place in the 50’s. The first Holden cars were upholstered with leather from three different tanneries, including a Zwar tannery. In 1926 two large diesel engines were introduced to provide added power and electricity. So much excess power was available that on June 8th 1927 the Company began supplying electricity to the Town and Shire (and this continued until 1946). Up to 400 tons of wattle bark was used in the Tannery in a year. Effluent disposal was washed into a stream running through the factory, caught in miniature weirs where it decomposed, and was then sold as fertilizer. In 1930 the Company bought out Goldings Pty Ltd of Canterbury, a sports shoe and rubber company famous for its tennis and golf shoes; and also bought out Robert S. Don Pty Ltd of Brunswick – a sporting goods business. Both companies were large users of Zwar leather. Depots were established in all the capital cities of Australia. An amazing variety of products left the Beechworth tannery, made from a surprising variety of sources. ”some myrabolums, valonea and extract of oak which are used in the tan pits, the two former being species of nuts from the East Indian trees and imported from Smyrna and India”. All the above quotes are from J. J. Macaulay’s extensive history of the Tannery. On another occasion he got his trousers wet on the way to work. He took them off and hung them by a boiler – but too close – and burnt the seat out of his trousers. His favourite fishing spot was Dora Dora. On one fishing trip he had stomach troubles. Going into the little pub he took a large dose of salts (He tended to do things in a big way!). Later in the day, fishing with his sons from a boat out in the river he suddenly ordered the boys to row for the shore and quickly. But before they had reached the shoreline time had run out, so he leapt over the side into waist deep water and called out, “Too late – and don’t you tell Mum”. One day the boys took their mother to the races – a new experience for their home-loving Mum. The bookies were shouting their odds, concluding each call as usual with “bar one”. The boys were embarrassed when their mother went to the bookies and wanted to put her money on “Barwun”. The Company was beginning to make a good recovery when Albert Michael Zwar died on 23rd February 1935. He had taken ill less than a fortnight earlier. The ‘Advertiser’ [now owned by two of Albert’s sons] edition of Sat Feb 16th reported that Albert had been ill for the past few days and had been admitted to the Ovens District Hospital, with the possibility of an operation. On Wed 20th the Advertiser reported that Albert’s cousin, the brilliant surgeon Dr. Bernard Zwar had operated early on Saturday morning and there had been a slight improvement. On Sat 23rd the newspaper was pleased to report much progress in the recovery of the Hon A M Zwar M L C, but he passed away the same afternoon. Beechworth had lost its Giant. Albert had lived there for 47 years and now he was mourned not only by the people of Beechworth but also by those who walked in the corridors of power and Government in Victoria. 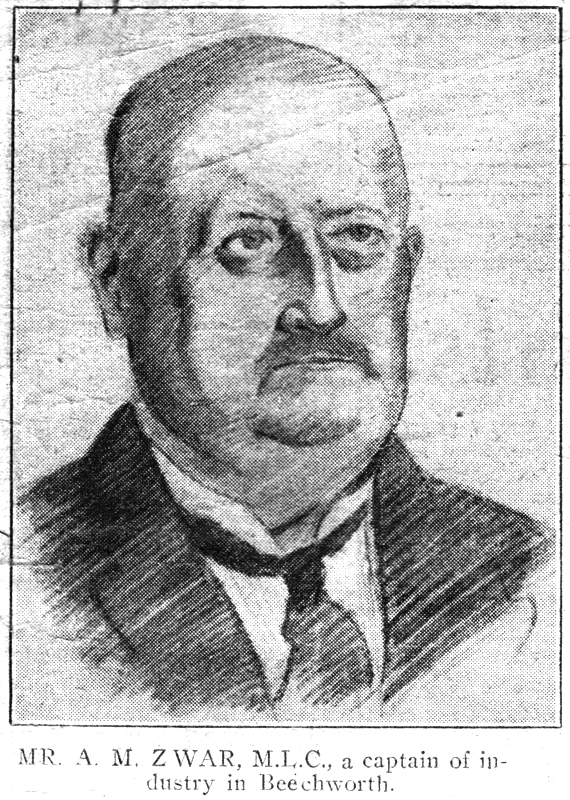 In 1922 Albert had been elected unopposed to the Legislative Council of Victoria for the United Country Party, representing the North Eastern Province. He was always elected unopposed and still held this responsible position of Government at the time of his death. “in Beechworth, …when the fortunes of that town were at a low ebb, he established and built up by his business ability an industry which restored a large measure of prosperity to Beechworth. Hon. A. M, Zwar. M. L. C.
“The late Mr. Zwar was a staunch adherent of the Church of England, and liberal contributor to its funds. He installed the electric light in the church and the congregation have reason to be grateful to him for many other acts of generosity. Although he did not aspire to civic honours, he took an active interest in practically every movement in the town after the firm became established. He was president of the Ovens District Hospital on several occasions, finally resigning from the committee of which he had been a member for over 20 years, in August 1926, owing to the increase of his parliamentary and business duties. He was also president of the Technical School Board, a liberal supporter of all charities, the Town Band and all sporting bodies and at the time of his death was President of the Bowling Club (a position he had occupied for 26 years, of the Rifle Club and of the Beechworth Club. His hobbies in sport were fishing and shooting. …An outstanding trait in Mr. Zwar’s character was his liberality. Not only did he contribute largely to the various institutions and public subscriptions of various kinds, but did many acts of charity by stealth and in addition was always ready to help a struggling person in business and many people who are now in comfortable circumstances can thank the late Mr. Zwar for setting them on their feet. …Preachers at all the local churches of every creed and denomination at last Sundays services made special references to the many kindly services Mr. Zwar had rendered them and the loss the community would sustain by his death. Many other groups and organisations either marched with the cortege or were represented at the graveside. The service of the Anglican Church was conducted by the Rev. W. S. Dau on Monday 25th February. Albert Michael Zwar was nearly 72 years old when he died. His two youngest children, Una and Leila had predeceased him. He left behind to mourn his passing his other four children – Doris, Keith, Raymond and Bernard and their families as well as his devoted wife. Harriet Augusta Zwar outlived her husband by 13 years. Her life came to its end on 24th March 1948.